Home > All the Great Reasons To Join AlaskaJobFinder! All the Great Reasons To Join AlaskaJobFinder! We have compiled the absolute best set of resources to help you secure your job in the Alaska commercial and sport fishing industries. All the latest job openings! 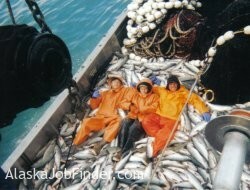 THERE’S MORE – AlaskaJobFinder Sets You Up To Succeed. You also get full access to our searchable database of detailed profiles of over 12,000 employers! Why Should You Sign Up for the Members Area? Featured Jobs – Job postings from employers that need employees right now! Many of these job postings are not advertised anywhere else. Not just fishing jobs! We have lots of job listings and detailed profiles of cruise lines, tour companies, adventure travel companies, fishing/wilderness lodges and other great employers in Alaska. Learn about the pending Alaska Natural Gas Pipeline project that could employ thousands of people over many years. The information compiled in the Members Section of our site was written by people who have actually traveled to Alaska and worked in its fishing industry. We began hard-core research on Alaska fisheries employment in 1985, including annual summer trips to nearly every coastal fishing town and processing plant and meeting with hundreds of workers and employers, so we know what we’re talking about! Subscribe to the Members Service, and you’ll get the whole scoop. You’ll not only be prepared for your foray up North, but you’ll also be able to impress employers with your extensive knowledge, which will give you a distinct advantage in any interview you may have.